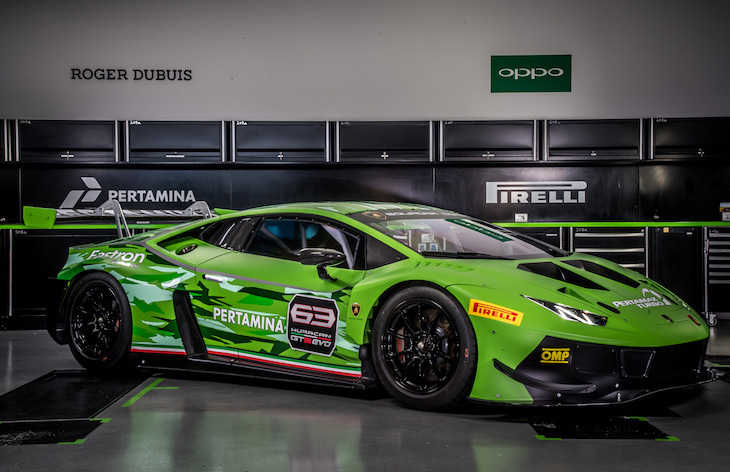 Lamborghini 2019 Huracan GT3 EVO has been unveiled during this weekend’s Blancpain GT Sprint Cup meeting at the Nürburgring. A wide-ranging evolution of the current (2015 vintage) GT3 version of the Huracan sees changes to the aerodynamics, cooling, electronics and suspension as well as a myriad of other detail changes. Giorgio Sanna, Head of Lamborghini Motorsport, commented: “The new Huracán GT3 EVO is the result of experience gained over the last three years of races on circuits worldwide. “The main objective during its development was to improve drivability to make the car easier and more predictable for gentlemen drivers, with low management costs for the teams. 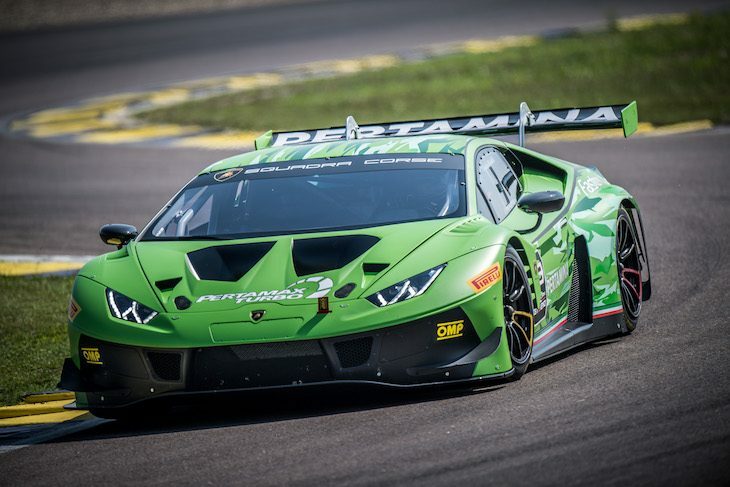 “What we offer to teams that have invested in Lamborghini in the GT competitions of the past is the opportunity to update the current Huracán GT3s with an EVO kit homologated for the next three years of races. 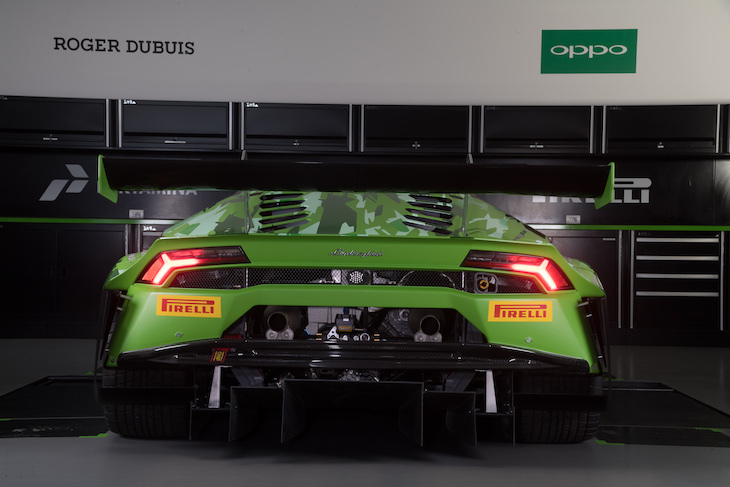 The current version of the Huracan GT3 has taken 12 international titles as well as class wins at the Rolex 24 at Daytona and 12 Hours of Sebring with the new car set to make its competitive debut at Daytona in January 2019. Work has been undertaken to improve stability and reduce pitch sensitivity. Both the splitter and the front ‘hood’ have been modified. The radiator features an improved cooling capacity thanks to the carbon fibre replacing fiberglass. The bumper has new lateral recesses that house two large flicks to ensure a high front downforce. The rear carbon fibre wing features ends modelled with two twists to optimize aerodynamic efficiency. The diffuser features redesigned fins. The supporting arms, previously made of steel, are now made of billet aluminum improving the rolling phase and the connection between the two axles. The rear axle features new hubs, bearings and axle shafts with the use of tripods instead of constant-velocity joints for greater transmission efficiency and easy maintenance. The Öhlins shock absorbers have been changed to four-way units, to ensure optimal control during the rolling phase, confronting curbs at high speeds. 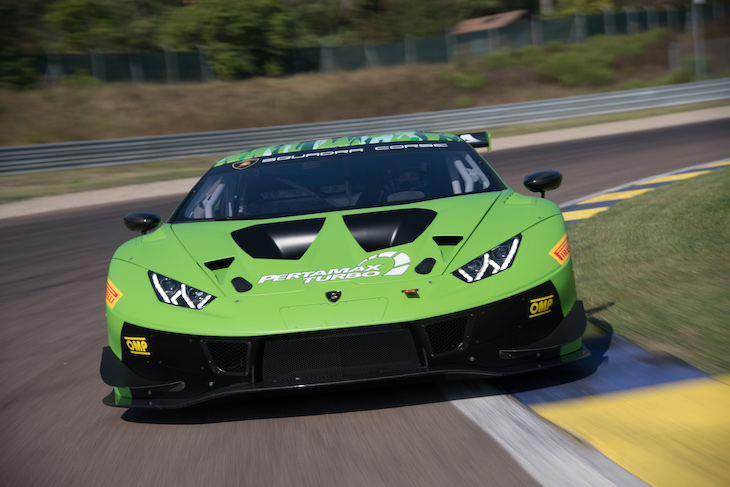 EHPS, Electro Hydraulic Power Steering, already successfully tested on the Huracán Super Trofeo Evo, is introduced on the GT3 EVO with a switch to adjust the level of power steering assistance while running. The new car features a new Bosch ABS system. The 5.2 litre V10 features upgrades carried over from the latest generation of roadgoing Huracáns, with new camshafts and titanium valves to enhance drivability and provide greater reliability in endurance races. The Huracán GT3 EVO features a redesigned roll cage which facilitates access to the roof hatch and offers better comfort even for taller drivers.